The Bug Doctor: Adam Villareal, owner and president of Insight Pest Solutions, entomology nerd, and family man. To help demystify the world of bugs, the Bug Doctor answers your questions during our weekly “Ask the Bug Dr.” blog feature. You can submit your bug and pest control inquiries for him on our Facebook page, by tweeting @insightpest, or commenting below. It’s 3 o’clock in the morning. You wake up needing to use the bathroom. You really shouldn’t have had that last cup of tea at dinner. You turn on the bathroom light and to your surprise, you apparently have something resembling the Summer Olympic Games taking place in your bathroom! You allow your eyes to adjust for a second. You force yourself to take a second look. One, two, three, four, you count. You shake your head in disbelief as your inner child wants to screams and run away. “What are these things?” you ask yourself as you quickly grab a nearby copy of Entertainment Weekly. Not tonight, my friends, not tonight. You lay back down in bed. Laying there, you can still picture their little alien-like features before smashing them into the cold tile. You get up to investigate. You go back into the bathroom, hoping to identify the smashed intruders but apparently your blow was that of a mighty one. You grab a tissue and wipe up the lifeless silvery bodies. Oh well, maybe that was all of them. You truly have no idea just how wrong you are. You go back to bed and quickly fall asleep. The next day you’re at work and talking about the previous night’s chaos around the water cooler with a few co-workers. You describe their color, their tear-shaped bodies, even the three pointer thing coming off of their backside. All of a sudden, one of your coworkers mentions silverfish. Once you browse the Internet for pictures, you see faces of the guilty party staring back at you like a police lineup. Now you have them identified. If you find yourself in a situation with silverfish slithering around your home, here’s the important information you need. If you know what to look for and where, it may help you in preventing and ridding your home of a silverfish infestation. 1) Know what the signs are of an infestation are. Silverfish can reproduce very quickly, so noticing the visible signs of an infestation may aid you in treating your home accordingly. Silverfish are nocturnal, so seeing these pests during the day or in high numbers may indicate that the infestation could be heavier than first imagined. Silverfish prefer carbohydrates (sugar & starches) but they are also known to eat other insects and dead skin cells. They will often feed on wallpaper, wallpaper glue, the binding in books, photos and linens. Noticing small holes in these materials may also be an indicator. 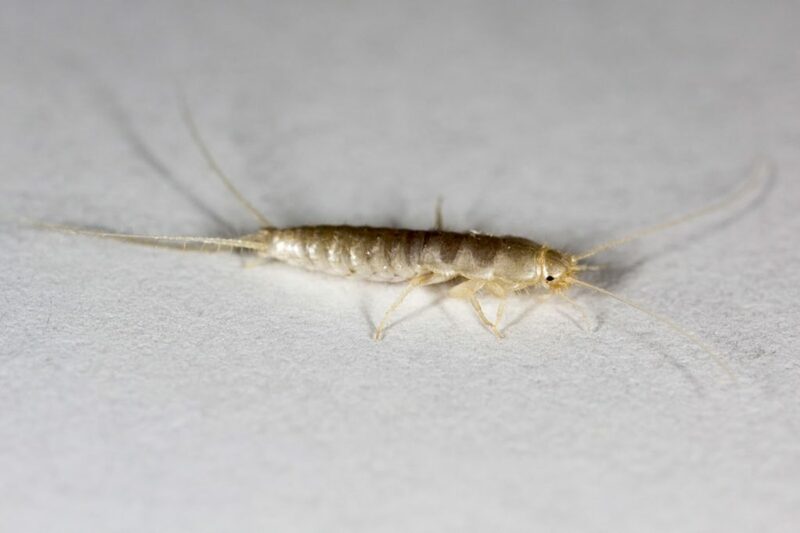 Silverfish are also very common in “new-build” construction; these structures provide fresh materials for them to feed on, such as caulk and glues. 2) Know where they like to hide. Silverfish love to hide in areas that have a high relative humidity and high moisture. These areas include, but are not limited to, the kitchen, bathroom, laundry room, crawl space/basement, and the attic. Silverfish are often found in small crevices around the baseboard. 3) Take steps to prevent an infestation. Address the areas of moisture and humidity. Perhaps, think about installing a dehumidifier within the main living space or even in the crawl space or basement area. Check for plumbing leaks, or perhaps it’s time to check the “R-value” of your installation in your attic. Check your windows, maybe your windows need to be caulked or even updated. Store old books and pictures in an airtight container. Caulk around baseboards and trim. These areas make great harborage locations for pests. Keep housekeeping to a high standard. This eliminates harborage areas and possible food sources. There are a lot of tips and tricks that you can use, such as homemade traps. But, while there are over-the-counter products and traps that give some short term relief, because of the fast reproduction rate of silverfish, the battle may be ongoing for a very long time. 4) Seek professional treatment. At the first sign of a silverfish infestation, contact your local pest control professional. Silverfish will not simply go away. Your technician will inspect areas of concern and will determine the most effective treatment. If the information and tips provided helped, share with us in the comment section below. For more expert pest control tips, check out our guide. For more on silverfish, take a look at this page by University of Minnesota Extension. Do you have a question about bugs or pest control? We’d love to hear from you. Let us know on our Facebook page, in the comment section below, or by tweeting @insightpest. You may see the Bug Doctor’s answer to your question in a future post. Let Us Solve Your Pest Problems! The Most Overlooked Superfood is…Bugs?